On your way to ...? Each Ming imperial cemetery has a road with statuaries, monuments and structures leading up to the main tomb entrance. This is known as the "Sacred Way". This page will concentrate on the Sacred Way in front of the Ming tombs north of Beijing. First on the road is a stone archway followed by a Great Red Gate about one kilometer further north. The latter is the official entrance to the entire cemetery. Half a kilometer behind the gate lies a pavilion housing the Divine Merit Stele, followed by an 800 meters long path lined with statuaries and monuments. Note that each statue comes in duplicates -the overview (left) only shows one of each. 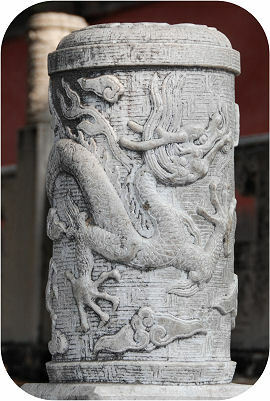 The path ends in the "Dragon and Phoenix Gate", also called the "Flame Gate". Some two kilometers further north is the seven-arch bridge followed by the five-arch bridge. The Sacred Way runs approximately 7.5 kilometers, so bring comfortable shoes if you intend to walk its entire length.